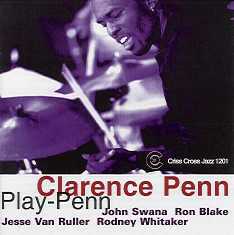 Penn's Landing , Clarence Penn's debut recording, received copious critical accolades, including a Year's Ten Best from the " New York Times ". On Play Penn , his follow-up, Penn augments the two-horn (Ron Blake, tenor sax; John Swana, trumpet) - two rhythm (Rodney Whitaker, bass; Penn, drums) with Monk Award winner, Dutch guitarist Jesse Van Ruller. They match the level of the previous record, traversing with incessant swing a broad range of tempos, textures and emotions.